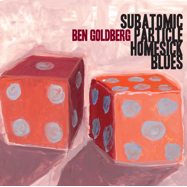 Okay, here's the line up on Subatomic Particle Homesick Blues. Ben Goldberg on all things clarinet, Joshua Redman (tenor saxophone), Ron Miles (trumpet), Devin Hoff (bass), Ches Smith and Scott Amendola (drums). As you can see, one has to go into listening to this recording with a certain heightened expectation of what will happen when Miles, Redman and Goldberg get in the same room. My only fear is they may play it too safe. The opening track 'Evolution', is a wonderfully played take on New Orleans and what I hear as their musical rebuilding process. What begins with long somber tones, evolves into a dutch old style Dixie romp before descending back into the darkness from where it came. The fun and mutual respect is palatable on this track. Even the pauses contain part of the story. You can almost see them smile behind their mouthpieces. 'Ethan's Song' is like slipping on your favorite pair of trousers after a long hot shower. No rush, one leg at a time. It is here that I started paying attention to Hoff's bass and how beautifully recorded it is. I have always found it difficult to get good bass response from a MP3 at the best of times, but this recording seems to address this issue better than most. It holds onto a mellow tone but yet cuts through everything placing it right into its own proper bank of frequencies without sacrificing any of the groove. Make no mistake, as musician heavy as this recording is, it is still very Goldberg and if at any point you needed a reminder, just listen to 'Study of the Blues', a horn fest of the highest level. Ches Smith puts his stamp on just about everything he touches. Every time I see clips of him play, I am reminded of the famous self description of the great Mohammad Ali; 'Float like a butterfly, sting like a bee.' Here he does it with a heightened grace, as there are few tracks that require aggressive drumming. As the title suggests, this really is a blues album, and as a parallel nod to Bob Dylan's 'Subterranean Homesick Blues', it is also a very lyrical recording with very structured passages. Even if you are not completely in the mood to listen to this type of release, before you have finished, it will put you there, aided but tracks like 'Asterisk'. Things get a little more upbeat on 'Who Died and Where I Moved to' and freer on 'Lopse' but all in all it is a very introspective listen even if sometimes it does sound a little safe. I've been following Ben Goldberg from the beginning also, or I should say I heard the early ones as they came out. I kind of miss his more abstract style and his great collaborations with John Schott (and Mike Sarin) - "What Comes Before", a real classic, as were some of the other ones such as "Junk Genius". I think that Ben's move into the Tin Hat Trio helped change his concept, and gave him a higher profile among musicians. Since that time he seems to have adapted his concept so that its a little more mainstream. I'll be posting a review of "Unfold Ordinary Mind" shortly, also from 2013, and also with a great line up. Thanks Joesh. I look forward to reading your review. I listened to "Unfold Ordinary Mind" as soon as I finished my review and was instantly hooked on the Nels Cline addition. Yes, nice addition I find. I should also add that I'm a big Ellery Eskelin fan ... who also appears on this release, as you already know.